Designed to easily and rapidly sample DNA from saliva. Self-contained unit contains sterile swab and liquid preservative. Ideal for rapid sampling or for donors that can’t easily use a spit collection vial and where multiple aliquots are not required. Simply open the swab, collect the saliva sample from the mouth, invert swab into preservative and ship. 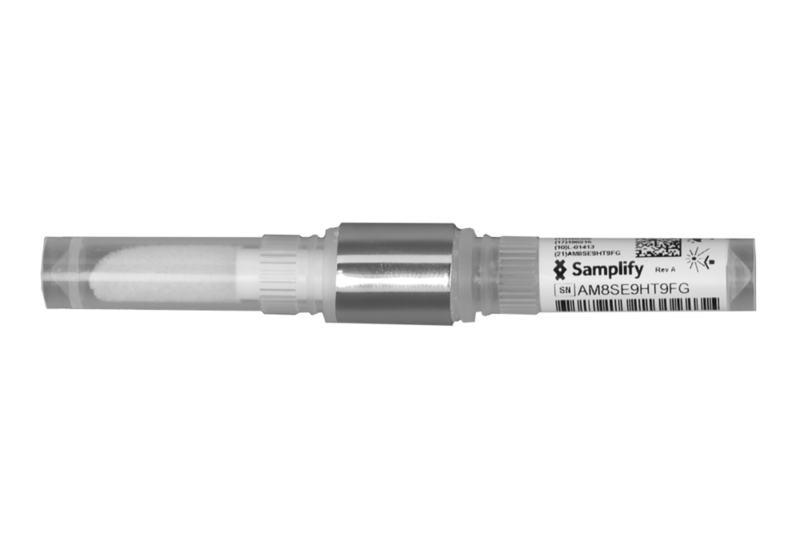 The Samplify SE-2030 delivers yield and concentration that exceeds industry performance for swab based DNA saliva collection kits as well as concentration that exceeds nearly all vial based saliva spit collection kits. It is only topped by the Samplify SD-3000 Dry Preservative DNA collection kit. The flexible high-capacity swab has good mouth feel and quickly collects the saliva sample in a matter of seconds. The kit is designed to release the saliva from the swab to achieve high levels of concentration. Samplify high-performance liquid preservative contained no ethanol and performance has been demonstrated in the related SD-3000 Family of products. The sample’s cells and microbes are lysed and the DNA is preserved.